So I went to Tria for the first time last weekend…. and I also went there for the second time last weekend as well. Yes, I loved it so much that I went to 2 different locations two days apart; Tria Wine Room in University City on Friday and then Tria Cafe on 12th & Spruce on Sunday. Friday night’s adventure was dinner with a friend. From 4-6 PM they have $5 wines during happy hour. (I tried a white wine which I completely forget what it was and am by no means a wine connoisseur so you’ll have to excuse me. ) 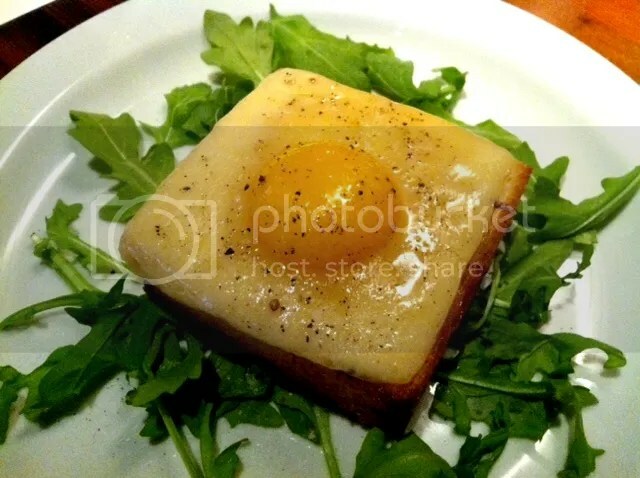 And for an appetizer, my friend and I both got their truffled egg toast with fontina fontal. I had been smelling truffle the entire time I was waiting for my friend and knew that I just had to get it (especially after my last truffle encounter). And as soon as I put fork to mouth – OMG – immediate mouthgasm. Every bite was a little bit of ecstasy. Everything about this dish was just perfect; from the way the cheese perfectly fit the bread to the truffle oil mixing with the egg yolk. I wanted to order like, five more of these. And then I got an amazing fig, gorgonola & pine nut salad with this rich balsamic vinaigrette and I was so hungry I ate it all before taking a pic. But that’s ok! Because then I went to Tria again for their weekly “Sunday School”, which features a beer, a wine and a cheese at a discounted price (the caveat being that you can only order one of each item). This week’s menu was Toro “Tinto Robles”, a robust red wine, butterscotchy Ascutey Mountain cheese and Ommegang Scythe and Sickle, a celebratory Harvest Ale. 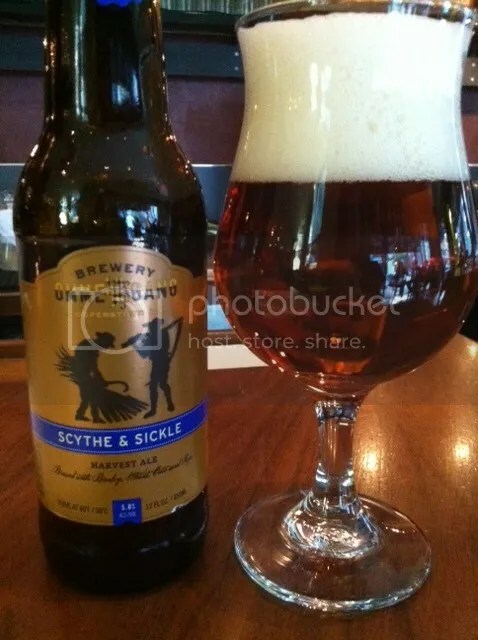 I started out with the Ommegang, which according to the menu was a refreshing alternative to all the other “pumpkin” and “Oktoberfest” ales that are out this time of year. I was worried it would be too hoppy, but it had a nice flavor and a bright amber color; very smooth, balanced and very tasty. I really enjoyed it. Then I paired the cheese and the Tinto. The cheese was very soft and creamy, and came with a side of local honey which I drizzled on and was very complimentary. The wine was also really good; smooth without an aftertaste that you can get from some red wines (And my entire mouth wasn’t totally purple afterwards!). The best part about my visit? All this amazing-ness cost less than $15 (before tax)! I definitely encourage any and everyone to check out Sunday School if you haven’t already. It’s definitely the best deal for a classy “Sunday Funday”. 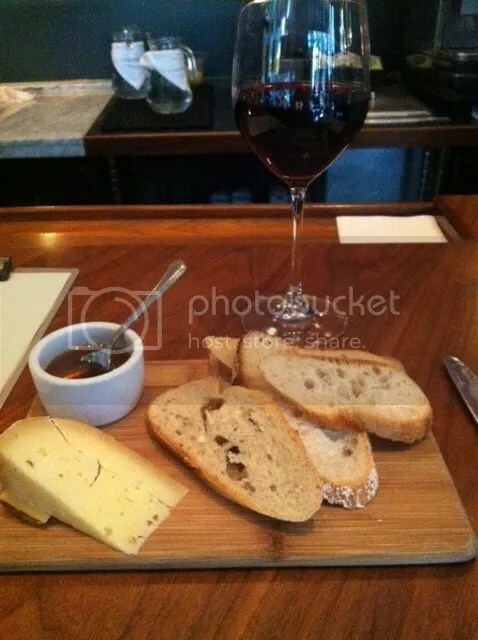 Posted in beer, cheese, honey, salad, Sunday, Tria, wine. Bookmark the permalink.